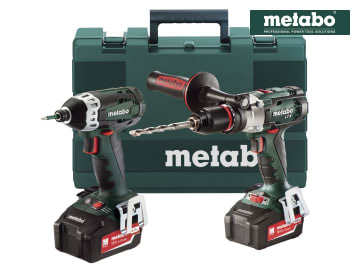 1 x 18 Volt SB18 LTX Combi Drill with selectable ‘'Impuls' mode, variable speed electronics and quick change chuck system. It has a precision stop, a mode switch for use when changing applications and a work light for better visibility. Capacity: Wood: 50mm, Steel:13mm, Masonry:16mm. 1 x 18 Volt SSD 18 LTX 200 Impact Screwdriver is a compact, powerful impact driver for tough applications, a high torque machine with low kickback. With 3 speed and torque levels for easy selection. 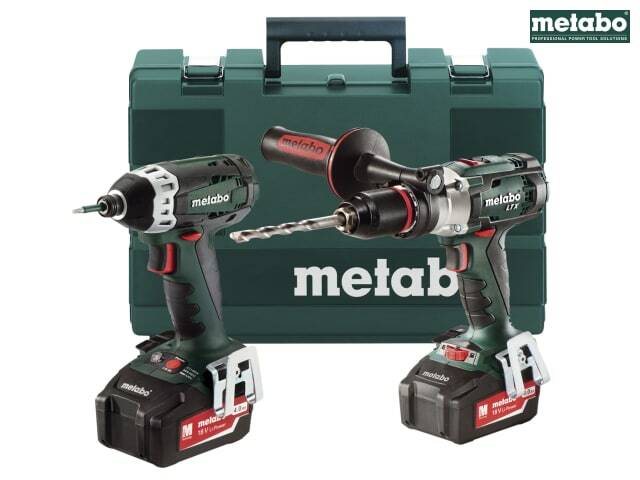 Includes Metabo 'Impuls' impulse feature for precise drilling on smooth surfaces, when the switch at the base of the handle is depressed, the motor pulses on and off. Giving a tremendous amount of control over the output of the motor. 1 x 14.4-36 Volt ASC30 Slide Li-ion Charger for slide type batteries. It features AIR COOLED charging technology, has a low stand-by input power and a charging time of approximately 30 minutes at 1.3Ah. Voltage: 14.4 to 36 Volt. Also supplied with 2 x 18 Volt 4.0Ah Li-ion Batteries and 1 x Carry Case.